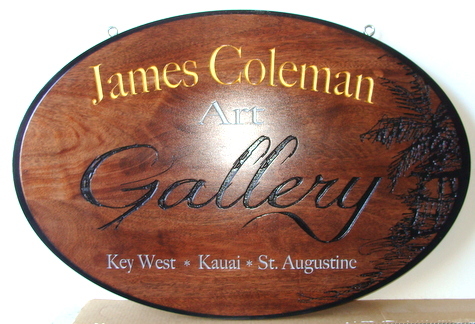 Above is a carved, mahogany wood art gallery sign with engraved text and logo of palm tree. Twenty-four karat Gold-Leaf has been applied to the engraved name of the gallery. The plaque was then double-coated with the finest quality UV protectant clear-coat. It can be hung from a scroll bracket or wood beam over a sidewalk, or mounted on a wall or placed in a window. To view many more retail and business signs in Gallery 28A, please click on "Return to List" below right.Return to List" below right.